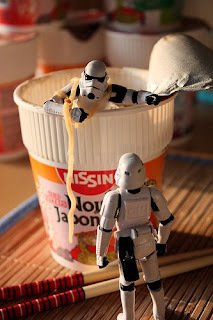 I read about the Stormtroopers 365 project and I must say, it makes me giddy like a gentle breeze blowing up ag's skirt. Stéfan Le Dû's project simply consists of one photo of Stormtroopers a day for one year. The photos are pretty slick, and seem to be pretty consistently funny and good natured. Personally, I love Stormtroopers, and would have gladly signed up to wear the suit and blast rebel scum had I been born a long time ago, in a galaxy far, far away.